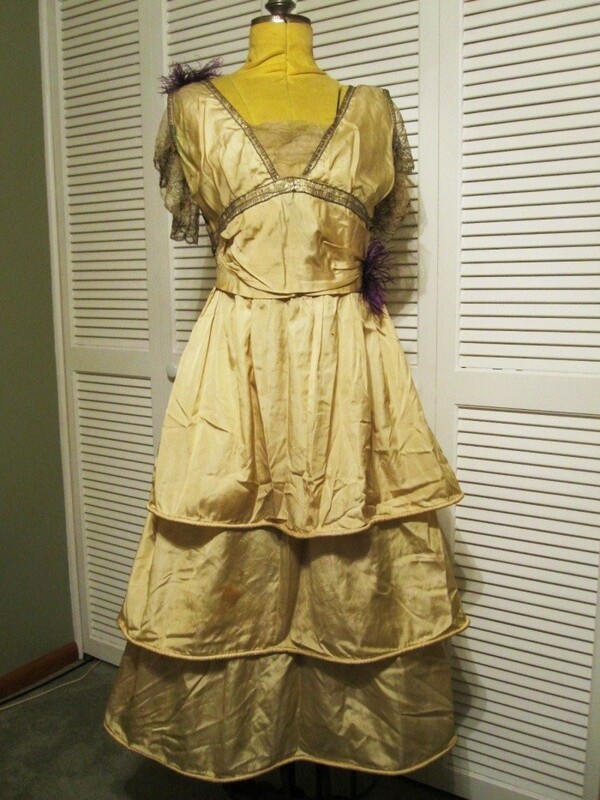 This lovely dress is just one of many that I will be auctioning this week. All are from the estate of 91 year old Miss Ruth McConnel of Alliance, Ohio. 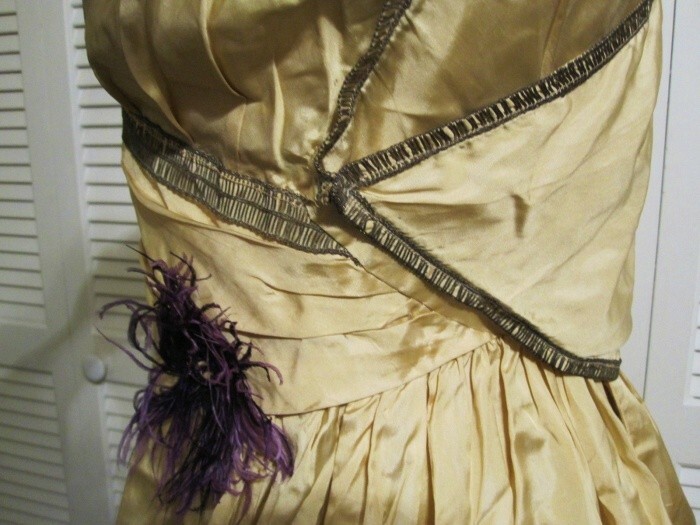 The Edwardian & Roaring 20's clothing belonged to her mother, Ethel while the 1940's & 50's belonged to her. Make sure to watch for her father's clothing too, Mr. George McConnel, founder of McConnel Insurance Company still in existance today. A vision in gold! I love the appearance of this dress and the way that it was made! 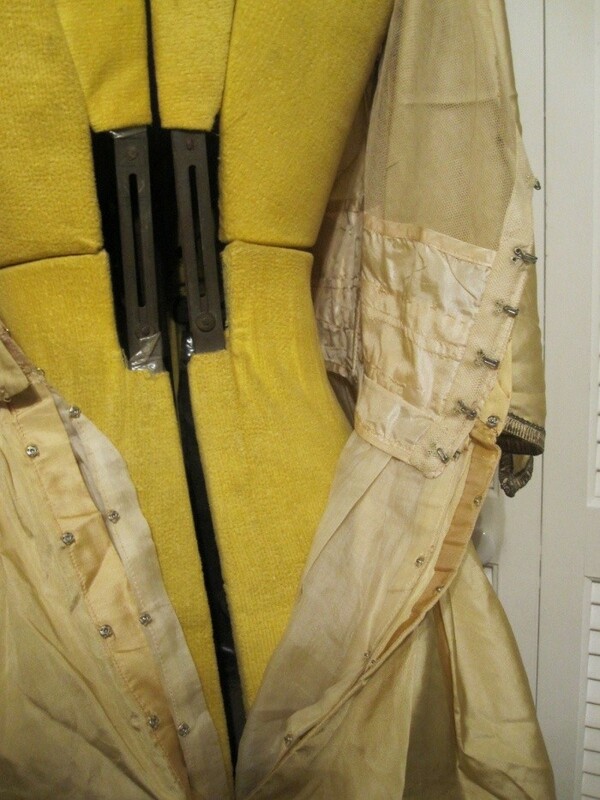 The silk bodice is daringly low, especially for the time, with only sheer mesh netting for cover. I would say that the front was made in an empire style with a cummerbund appearance but, the fabric from the right shoulder crosses down to the left & snaps just under the left breast yet the wide empire-styled cummerbund gathers on each side ~ so attractive. 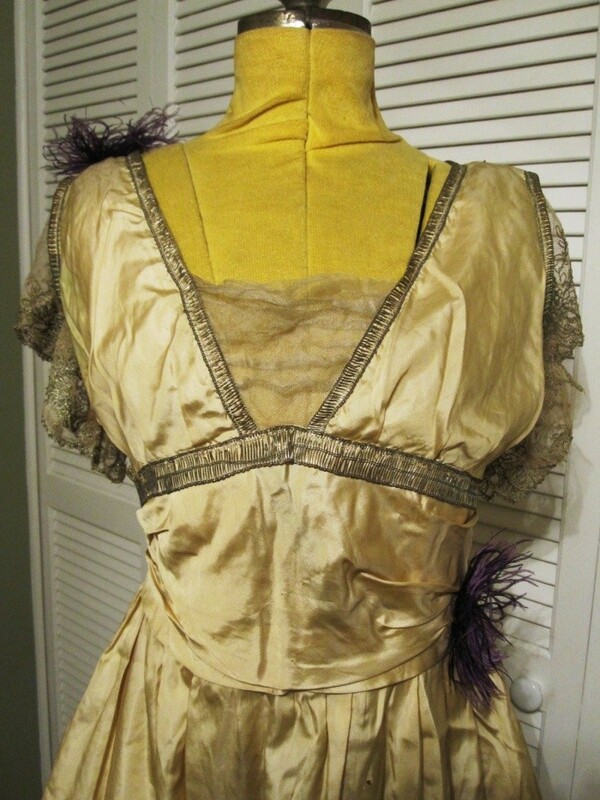 Dark gold metallic/silk thread is sewn like ribbon on the cummerbund, around the sleeves and in the deep "V" of the bodice. Love the dark purple ostrich feathers that adorn the shoulder & waist. One is missing from the opposite shoulder. The sheer mesh also serves as part of a camisole in the bodice with beautiful tambour net lace making up the sleeves. 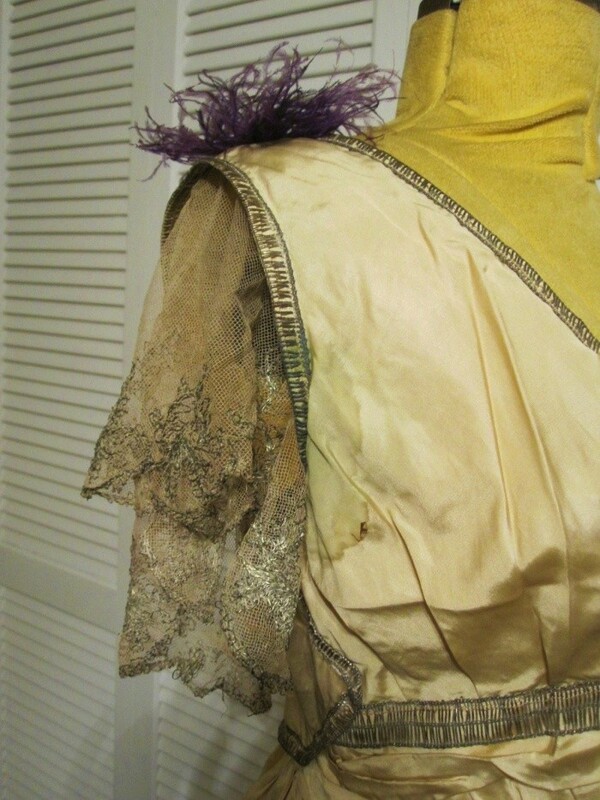 You will notice in my pictures that the lace there is torn but still salvageable is shortened. There is some underarm staining under the right sleeve. 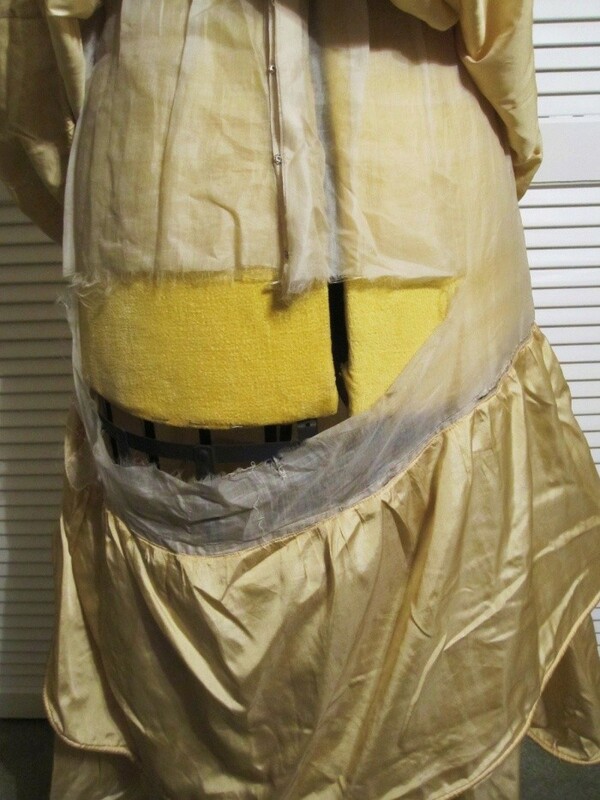 Three bellowing layers of silk, corded at the hemlines, make up the skirt. The top of each row is made of sheer ivory-colored silk serving as linings. You can see in the back of the dress that the lining of the 2nd row is coming loose & only needs sewn again. There are a couple stains that I did not attempt to remove... I'll save that for you experts. They do look like they are surface stains only & should probably come right out. The only other issues that I found is one tiny hole on the front side near the waistline & a couple small pulls in the silk, about 1/4" in size. 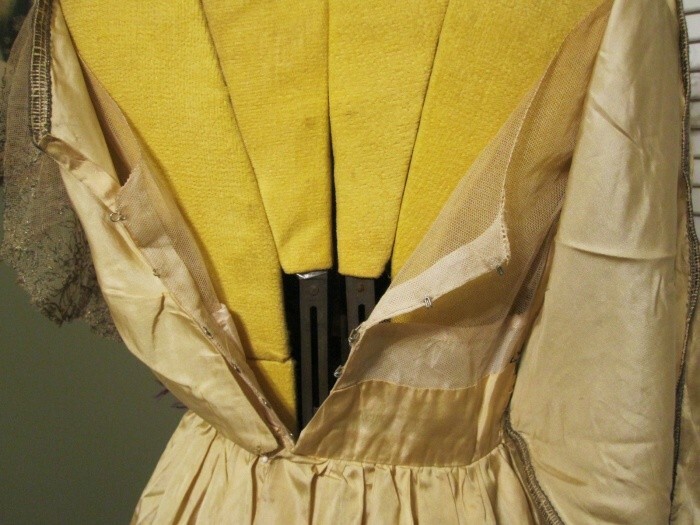 The bust measures 32", waist 28", 16" from across the outermost shoulder seams. 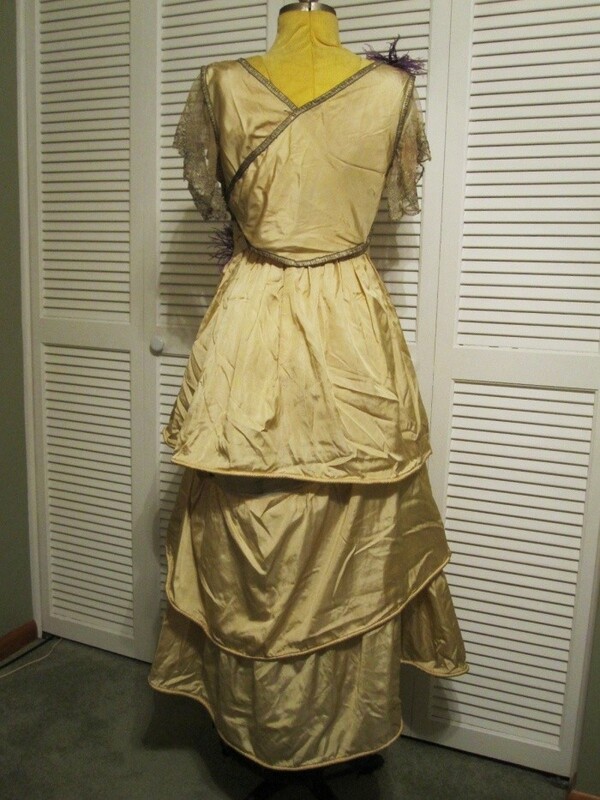 The skirt measures 31" long from the waist. I'm listing this as a study piece only because of the few repairs that need to be done. I believe the fabric is still soft enough, not brittle; and can be worn once repaired. If you have been looking for a dress of different design, this is the one! Please take a look at the other clothes I have listed. I'm always happy to combine shipping.